The Civil War (1861-65) was perhaps the most momentous event in American history. The survival of the United States as one nation was at risk, and on the outcome of the war depended the nation’s ability to bring to reality the ideals of liberty, equality, human dignity, and justice. Abraham Lincoln’s election to the presidency in 1860 brought to a climax the long festering debate about the relative powers of the federal and the state governments. By the time of his inauguration, six Southern states had seceded from the Union and formed the Confederate States of America, soon to be followed by five more. The war that followed between North and South put constitutional government to its severest test. After four bloody years of war, the Union was preserved, four million African American slaves were freed, and an entire nation was released from the oppressive weight of slavery. The war can be viewed in several different ways: as the final, violent phase in a conflict of two regional subcultures; as the breakdown of a democratic political system; as the climax of several decades of social reform; or as a pivotal chapter in American racial history. However interpreted, the Civil War stands as a story of great heroism, sacrifice, triumph, and tragedy. As important as the war itself was the tangled problem of how to reconstruct the defeated South. Encouraged by the 13th, 14th, and 15th amendments to the Constitution, African Americans at last nourished hopes for full equality. Their hopes were to be dashed. 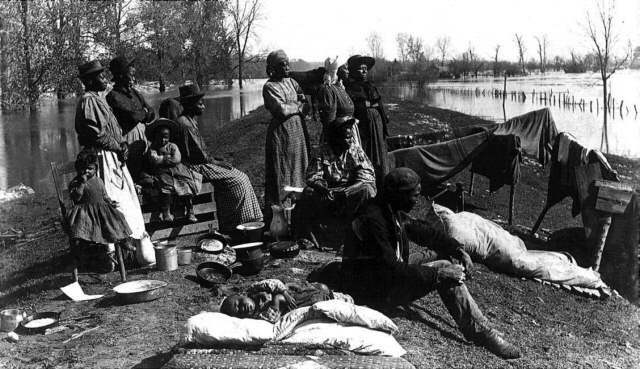 By 1877 Southern white resistance and the withdrawal of federal supervision brought about the “redemption” of the South and African Americans were disenfranchised. The redemption measures enforced greater racial separation and increased white intimidation and violence.